I love it for grilling steaks. We aren on our second Weber charcoal grill and absolute love it. We use it from May to October!! 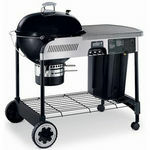 This grill was easy to assemble and the wheels are durable and great to make the grill portable. We cooked for 4-5 people when we used this and it had enough space. Cooks evenly and the grill is great quality. I love this grill. The ease of cleaning out the charcoal is one of my favorite features of this grill. The added hinge to hang the lid on the side of the grill is one of the best ideas yet! I have owned this grill for several years now and it still looks like knew. I can't say that about any other grill I have owned that wasn't a Weber grill! 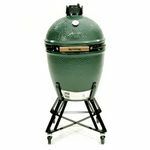 I won't buy any other brand because of the duribility and ease of use that Weber is know for and has proven. This is our go to for our family grilling. Excellent size for 4-6 people. It stores in a relatively small space, is light enough to move around and is very durable. I would buy it all over again if needed! We have had this grill in my family for about 30 years and we still haven't had to replace it! It has withstood the test of time and the elements and still cooks like brand new! I love this grill. I've never had one that didn't eventually break down from wear and tear but this one has yet to have a single part replaced. Grills perfectly every weekend we use it just like when it was originally purchased by my parents. Defiantly worth the investment! Nothing like a good grill! 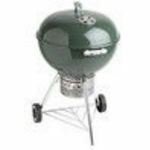 We are on our 2nd one of these Weber grills and as long as they are made we will purchase. We use it probably more than our stove especially in the spring and summer. Some may think the charcoal grill is a mess to use, but this one is easy clean up, even heating, portable and you just can't beat the great taste of real charcoal cooked food. Add your favorite wood for flavor! We just got the copper one and love it! My first one, and still moving along! This Weber girl was my very very first grill that I have bought, we have recently upgraded to a bigger one since we needed to upgrade, but back to this certain grill. 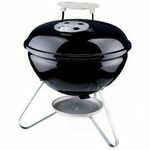 It's really easy to use, which is supper important, anyone that is in the marketplace, needs a grill that they don't have to do much work to trying to use! We still do use this when we go camping during the summer time, it's portable to use, and easier to take along with us! It make's some delicious food such as steak, chicken, corn the cob. (Which is a huge hit into our home) and other kinds of food! 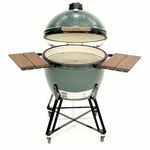 I love any type of grill like that this takes Charcoal because they are super easy to light up, and getting started fast too. I must say that this lights up really fast with the burners on this, and still to this day I am still using this grill off and on, and the huge bonus thing is how Long it works and matches up quickly!